Addiction can be devastating. Recent scientific advances have shaped our understanding of this common and complex problem. The good news is that there are a number of effective treatments for addiction, including self-help strategies, psychotherapy, medications, and rehabilitation programs. 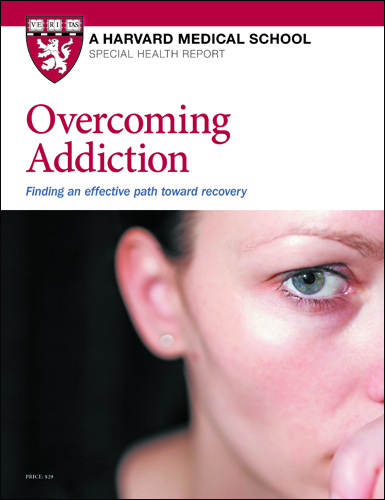 You can use the strategies presented in this report, Overcoming Addiction: Finding an effective path toward recovery, to discover new ways to cope with life’s difficulties. Addiction can be devastating. One of the most common expressions of addiction, alcohol dependence, causes an estimated 100,000 deaths annually — the equivalent of an airliner carrying 274 passengers crashing every single day. The good news is that there are a number of effective treatments for addiction, including self-help strategies, psychotherapy, medications, and rehabilitation programs, all of which are detailed in this report. You’ll also find targeted advice on specific types of addiction, as well as information about coping with a loved one’s addiction. More good news: several scientific advances have shaped our understanding of this common and complex problem. For example, brain-imaging technologies have revealed that our brains respond similarly to different pleasurable experiences, whether derived from psychoactive substances, such as alcohol and other drugs, or behaviors. Genetic research has uncovered that some people are predisposed to addiction, but not to a specific type of addiction. Finally, medications developed to treat one addiction have, in some cases, proven helpful for treating a different type of addiction. You can protect (and heal) yourself from addiction by having diverse interests that provide meaning to your life. Understand that life’s problems usually are transient, and perhaps most importantly, acknowledge that life is not always supposed to be pleasurable. Therefore, you don’t have to use a psychoactive substance to get away from the negative things that happen in life. Instead, you can use the strategies presented in this report to discover new ways to cope with life’s difficulties. What, why, when, and how? If you have addiction and you’d like to change your behavior, consider all the costs and benefits of the choices you could make. Don’t think only about the negative aspects of your object of addiction; think, too, about the benefits it offers. One important step to recovery involves understanding what you get from your substance or activity of choice, and how you might achieve the same benefit through other, less harmful means. Experts recommend doing an impromptu cost-benefit analysis by filling out a table such as Table 1. The example here addresses the issue of compulsive gambling, but it could be repurposed for any addiction. You can make a chart using your own addiction and your own costs and benefits on a blank piece of paper. When you fill it out, write as many items as you can think of to go under each heading. Weigh the importance of each answer. Do the benefits of continued use or participation outweigh the costs? If not, you may decide you want to change your behavior. I would have more money to spend on other things. I would have more time to spend with people I care about. My friends and family would probably be happier with me. I have fun when I gamble. I love the feeling of excitement when I gamble. I have occasionally won lots of money gambling. I would have to face the responsibilities I’ve been ignoring while engaged in my addiction. I would have to somehow fill up my time. I would lose my social connection to my gambling buddies. I am heavily in debt. I am depressed and anxious. I have angered my friends and family. If you decide to make a change, you’ll have to sort out exactly what, when, and how you want to change. That will depend a lot on your view of the problem. Those who are most invested and motivated to change will have the best chance of success. When do I want to make a change? Do I want to stop altogether or do I want to simply cut down? Measurable, meaning that your success should be easy to quantify. In the case of the goal mentioned above, you might keep a log of your consumption to be sure that you adhere to your goal. Achievable, meaning your goal should be something you are physically capable of doing today, and something that would be safe for you to do. If you drink chronically, round-the-clock, the sample goal might not be safe without the help of a doctor, because the interruption in drinking could bring on life-threatening withdrawal consequences. Realistic, meaning that it is something you believe you can do. Time-based, meaning that you should set a date and time when you start the goal, and you should examine your progress at regular intervals. Change is a gradual process and takes time. The first three to six months of change are usually the most difficult. The period after that will be hard, too, but not quite like it was in the beginning. If you get discouraged, remember that others before you have overcome addiction.